It’s without a doubt the hottest summer I ever remember since living in London, long gone is the English weather, which I have to say I’m starting to miss along with the green grass. 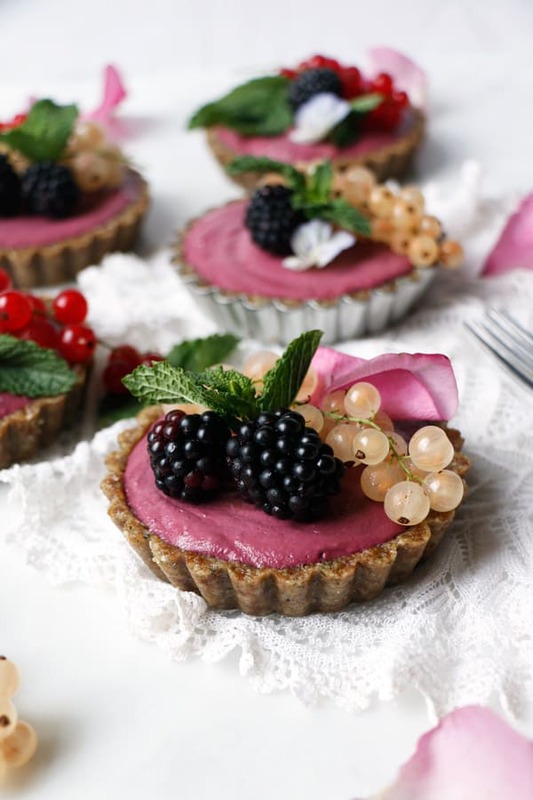 And so it’s another chilled recipe for you today – Raw Vegan Blackberry Tarts with a simple almond pumpkin hemp seed crust and cashew based berry filling. Originally I’ve made these with a walnut cardamom crust, but I just can’t decide whether walnuts go with blackberries and so I’ve changed the recipe to almonds. Feel free to replace and adapt the crust to your liking. Some of you might not like the hemp seeds so just replace them with more almonds. Filling is my usual berries-cashew-coconut butter, at the moment, my favourite combo that is full of flavour and keeps really well stored in fridge too. Also very adaptable and you can replace the blackberries with other berries or combination of different seasonal fruit. 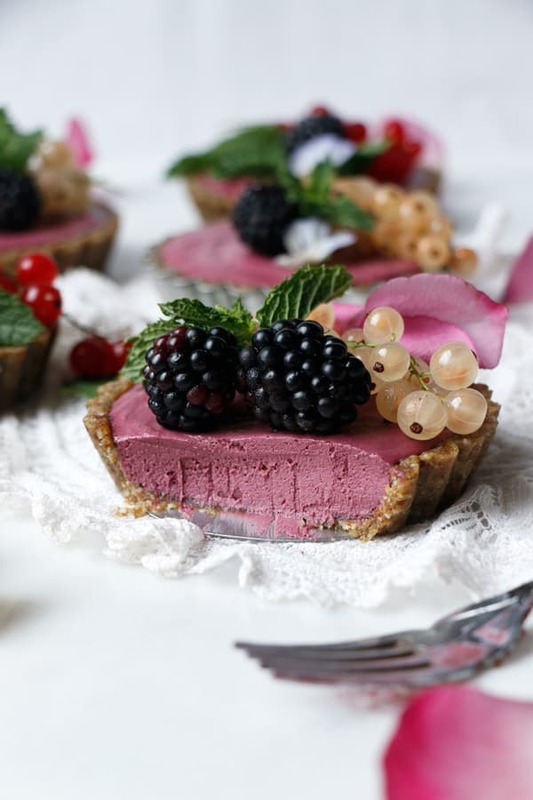 Using blackberries creates beautiful rich deep pink colour which develops even more when stored couple of days in freezer. 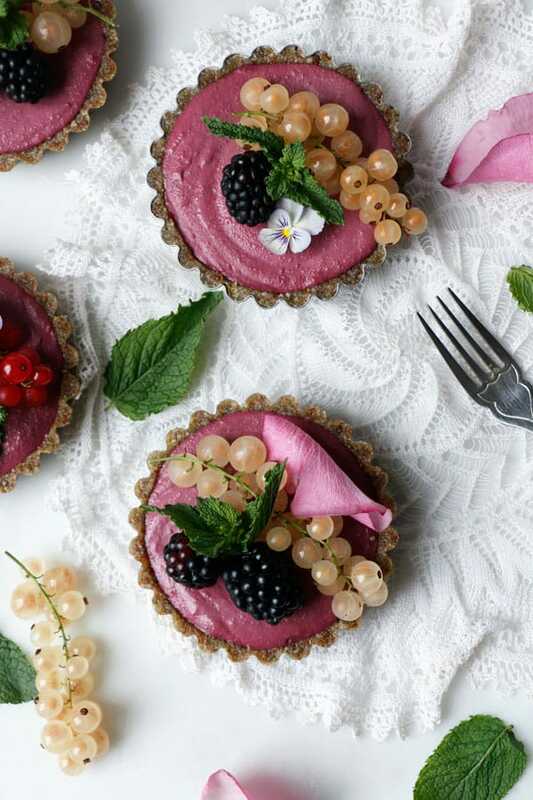 I love making these little tarts, they always look so pretty, special and perfect for any occasion. Enjoy! Place almonds and pumpkin seeds into food processor or blender and pulse few times until they are coarsely ground. Add hemp seeds, cinnamon, sea salt and pitted dates and blend until the mixture starts coming together when pressed. Add maple syrup if needed and blend until the mixture sticks together. Rinse the soaked cashews under running water and place into high speed blender. Add blackberries, lime zest, juice, maple syrup and vanilla and blend until smooth. Slowly add melted coconut butter and blend until incorporated. Make sure the mixture is at room temperature before adding the coconut butter. 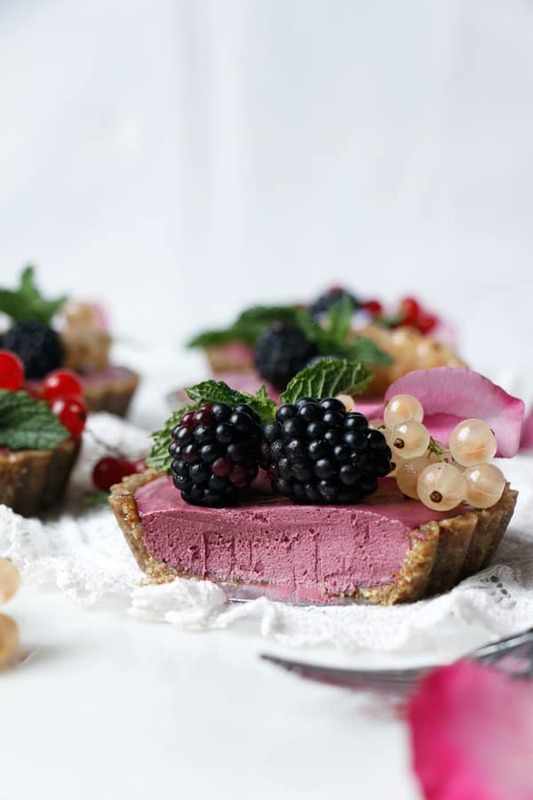 Spoon the mixture evenly into each tart and smooth out the top. 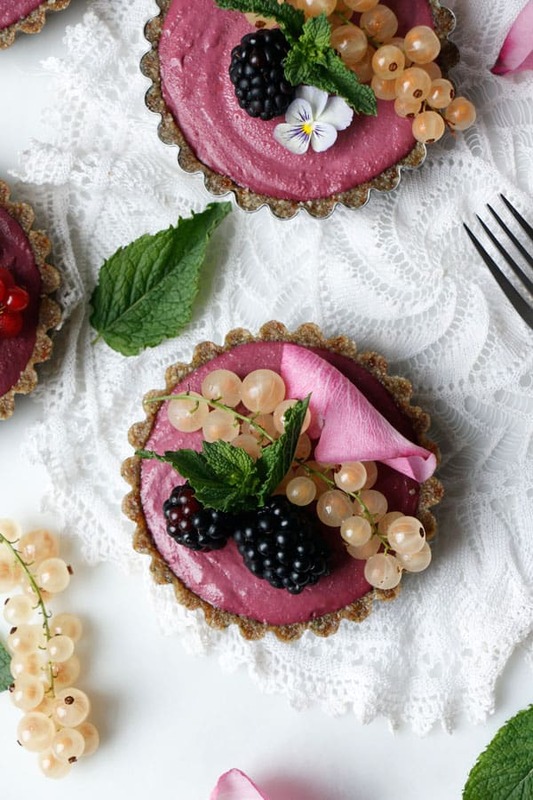 Give the tarts a tap couple of times if necessary. Place into a freezer for about 2 hours or overnight to set. 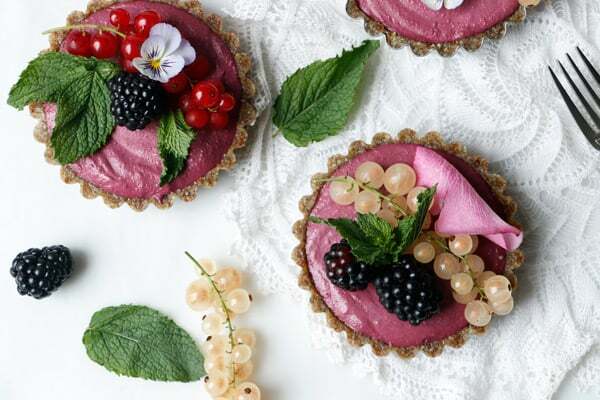 Once set carefully remove from the tart tins, top with fresh berries and some fresh mint. Leave to thaw before serving, but serve chilled. I've used 6 small 10cm tart tins with removable base in this recipe. You are truly an amazing artist. Every single recipe looks amazing. Thank you very much for all that you do. Good luck in your future creations. 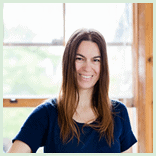 Adriana, thank you so much lovely for such kind words. It’s my bliss! Much Love to you. Another wonderful recipe Hana ,thank you. English houses are built for the cold to keep the heat in….so it must be very unpleasant during this hot summer. I have lived in a couple of countries where the summers are beyond hot and there was/is always the air conditioner or ceiling fan to turn on when it gets too bad. It’s just so horrible when you’re sleep deprived because it’s too hot to sleep. You’re so welcome Angela, so happy you love it! Hi! I don’t have coconut butter… What can I use instead? 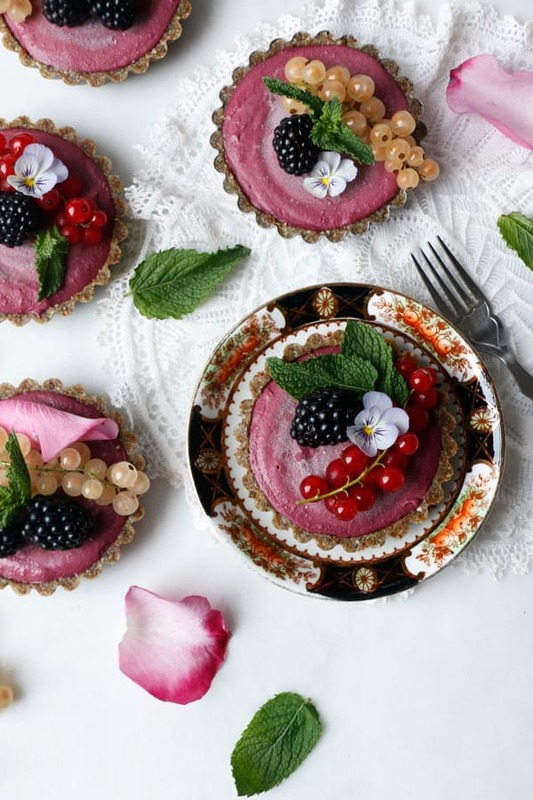 Hi Katja, you can make the filling as in my Raw Vegan Strawberry Tart recipe using coconut cream and coconut oil. Please check the instructions there. These are works of art…will try for the holidays….are those little grapes champagne grapes? Also where can I find your recipe for the walnut cardamon crust ? White currants…not widely available here in the states….will try online….made the cardamom crust today…very different….liked taste ….will freeze with the blackberry for Thanksgiving…hope I didn’t start too early…what do you think…they are for my adult son who is raw vegan…I’m so happy I found you!!! We share the joy and importance of presentation!! Hi Roni, the tarts will keep well frozen until Thanksgiving, don’t worry. Any seasonal fruit will look lovely on top, you don’t have to use the white currants, it will be tricky to find them now unless you can find some frozen ones. Maybe a little sprig of rosemary and cranberries will look the part. 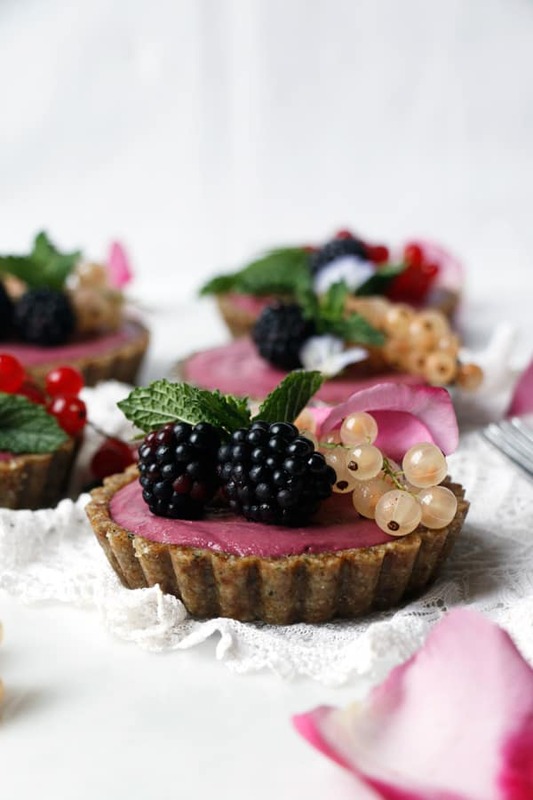 I do hope you will enjoy the tarts, wishing you happy Thanksgiving!